The quick down and dirty fishing report. People are catching steelhead on local rivers…but not very many. We had some nice spikes in river levels over the last couple of weeks and it brought a few fish into the rivers. As of this week river levels are all at prime levels, ie, very fishable. We have a couple nasty days of rain on the way which is always good for fishing but not real fun to fish in. The rivers will not rise much from the rain with a freezing level around 2000'. This week should bring some of the best sustained conditions for steelhead fishing we’ve had. There are not a lot of fish around so be thorough, fish well and with sharp hooks. Look for the next big spike a drop for larger numbers of new fish. Trout fishing will be good all winter on the Deschutes and other east side rivers. 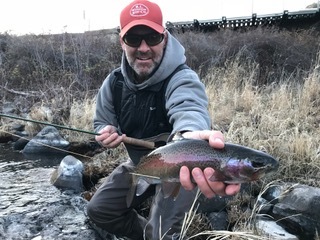 Standard winter tactics should include swinging sculpins and other streamers on heavy sink tips, nymph fishing, and an always open eye for blue wing olives mid day.